Disclosure: Macmillan Publishers sent me a copy of this book in exchange for an honest review. All opinions are my own. Do you have a smart phone? I held out for quite awhile and Steve held out even longer (even though his work pays for his cell phone). We didn't need the fancy phones, but now it seems as there is not much choice out there. I know when I went to a smart phone it was only like $10 more than replacing my broken phone with a flip phone and now the company I use for my cell phone only works on smart phones (and relatively new ones). Have you noticed smart phones seem to be taking over our lives? 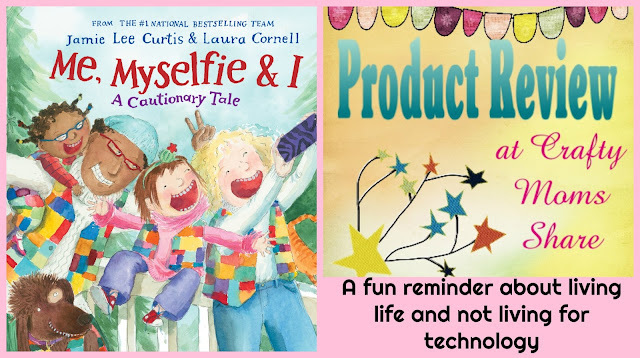 Today I am going to share a fun book about just that. 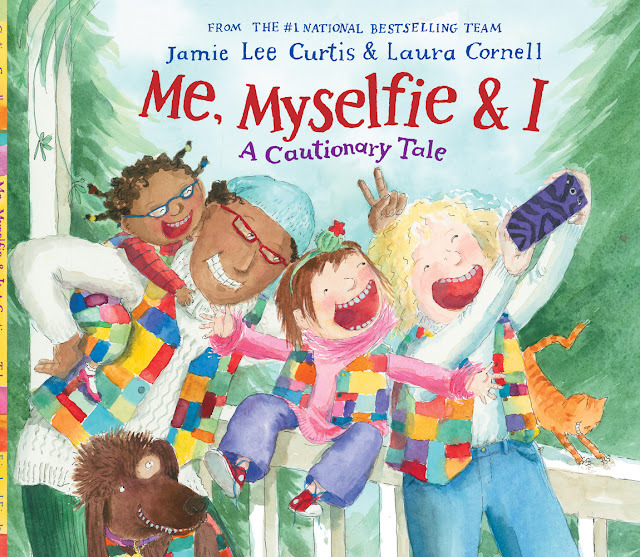 It is Me, Myselfie & I: A Cautionary Tale by Jamie Lee Curtis and Laura Cornell. It is recommended for ages 4 to 8, but I think it is even better for the parents out there!! Mom is old fashioned but when she gets a smart phone and discovers the fun of selfies (thanks to her kids) she goes a bit selfie crazy. She wants to take a selfie everywhere!! And she is getting the likes on social media. She is a bit tech-crazy!! The kids have enough of this selfie craze and I think they regret teaching her about selfies. Finally one of the kids refuses to take selfies with her and asks her to stop. The mom has a realization that it is more important to enjoy a moment with family and friends than get a good selfie to post. Things I love about this book are the message!! But also that it is a multicultural family. I love that it is the kids saying enough with the selfies and technology. The book is rhyming and just a sweet tale. I love how the mom goes so crazy that it would embarass the kids--a selfie with a bride and groom she doesn't know, dance class, etc. The kids are happy when they have technology free nights filled with cuddles and storytime. Our society has pushed too far with our technology. I know it bothers me when I go out to eat with friends or family and they are on their phones constantly. Have you noticed this? Does it bother you? Have you tried a screen free night at your house? I think I may start having one at least weekly. Will you join me?